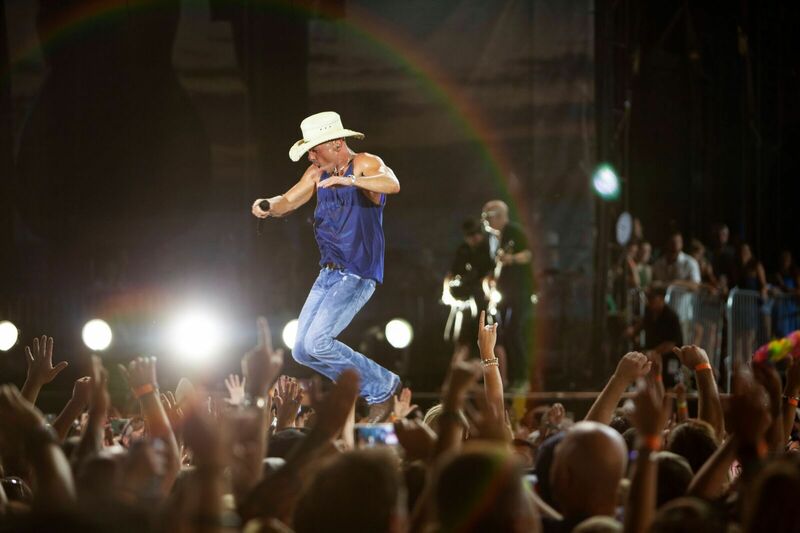 Kenny Chesney stopped cold onstage at Lincoln Financial Field as he was winding up his three week No. 1 “American Kids,” overpowered by the crowd’s cheers. When 30 seconds passed, he leaned into the mic and told the crowd, “THIS is why we can’t wait to… get to… Philadelphia every summer.” The crowd’s cheers grew louder, until the record-breaking sold out crowd of 55,238 sang an a cappella chorus of the freewheeling celebration of youth back to the songwriter/superstar from East Tennessee. As special as that moment was, it was only one in a series that marked the eight-time Country Music Association and Academy of Country Music Entertainer of the Year’s ninth trip to the home of the Philadelphia Eagles. David Lee Murphy was met with roars, as he emerged from the wings to join Chesney for their Top 5 and climbing duet “Everything’s Gonna Be Alright,” with footage from Love for Love City’s work in the Virgin Islands playing behind them. Also on hand was a contingent from the St. John School for the Arts, who’ve been a recipient of Love for Love City’s efforts. Several students, teachers and their parents were recognized from the stage, connecting the dots for Chesney’s humanitarian efforts for the little island school where music is such a priority. As emotional as those moments were, nothing could have prepared the crowd for the news that “Boys of Fall” was going to make its Trip Around The Sun Tour debut. Explaining to the audience, “I wanted to play it for the first time this summer in the home of the Super Bowl Champions,” the stately introduction unspooled to the song that honors the power of football to bring young men together. The audience raised their arms and voices, swaying side to side and waving lighters to honor their championship team. But as the third verse climaxed, Chesney turned to the wings as fourteen members of the Eagles’ organization – including head coach Doug Pederson and quarterback Carson Wentz — streamed downstage with t-shirts, memorabilia and owner Jeffrey Lurie holding the Vince Lombardi Trophy. The Eagles had already given the Love for Love City Foundation a check for $25,000 earlier in the afternoon.